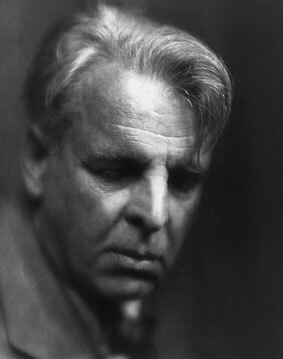 William Butler Yeats (1865-1939) var en irsk poet, dramatiker og visjonær. Yeats begynte å lese Swedenborg da han var i tyveårene. Han vant Nobelprisen i litteratur i 1923. Han redigerte senere arbeidene til William Blake i samarbeid med maleren og poeten Edwin Ellis. Da han mange år senere vendte tilbake til sine Swedenborg-studier, skrev Yeats at «It was indeed Swedenborg who affirmed for the modern world, as against the abstract reasoning of the learned, and discovered a world of spirits where there was a scenery like that of earth, human forms, senses that knew pleasure and pain, marriage and war, all that could be painted on canvas…». Under seremonien i Stockholm da han mottok Nobelprisen omtalte han Swedenborg i nobeltalen. Yeats’ berømte essay «Swedenborg, Mediums and Desolate Places» er nytrykket med fullt kritisk noteapparat i Between Method and Madness: Essays on Swedenborg and Literature, red. Stephen McNeilly (London: The Swedenborg Society, 2005).